C. W. Culpepper, Grandson, M, 4, LA/LA/LA. Laura Claudette Culpepper, Female, born __ 1955 in Titus Co., Texas, child of Claude Culpepper and Ida Belle Moore. Find A Grave Memorial# 152303755. E-mail written Sep 2010 to Warren Culpepper from Rocky Jardes (#61715), United Kingdom, e-mail address. Jean E Culpepper, F, b 17 Oct 1923, California, d 24 Nov 1973 Santa Clara Co., CA, 50Yrs, Maiden-Unk. 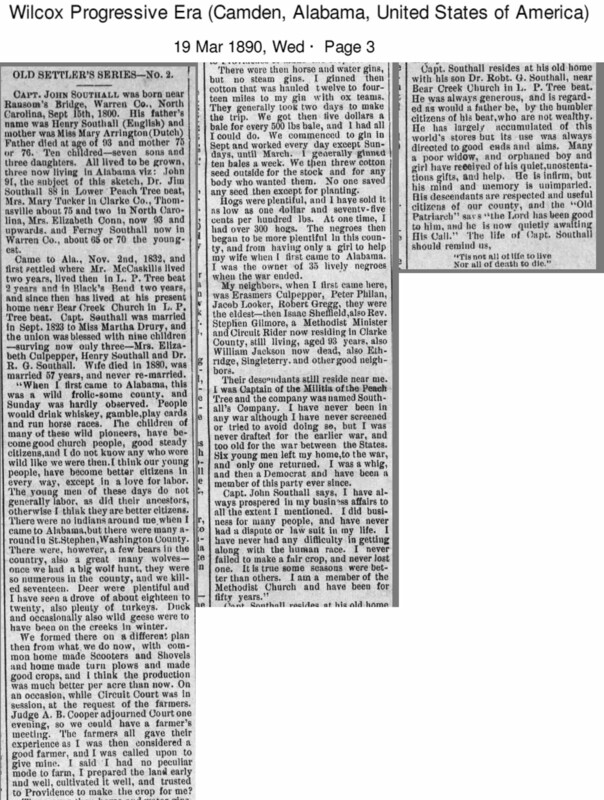 Wilcox Progressive, 19 March 1890, page 3.